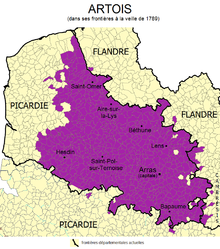 Originally a feudal county itself, Artois was annexed by the county of Flanders. It came to France in 1180 as a dowry of a Flemish princess, Isabelle of Hainaut, and was again made a separate county in 1237 for Robert, a grandson of Isabelle. 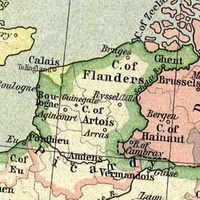 Through inheritance, Artois came under the rule of the dukes of Burgundy in 1384. At the death of the fourth duke, Charles the Bold, Artois was inherited by the Habsburgs and passed to the dynasty's Spanish line. After the religious revolts of 1566 in the Netherlands, Artois briefly entered the Dutch Revolt in 1576, participating in the Pacification of Ghent until it formed the Union of Atrecht in 1579. After the Union of Atrecht, Artois and Hainaut (Dutch: Henegouwen) reached a separate agreement with Philip II. Artois remained with the Spanish Netherlands until it was conquered by the French during the Thirty Years War. The annexation was acknowledged during the Treaty of the Pyrenees in 1659, and it became a French province. Artois had already been largely French-speaking, but it was part of the Southern Netherlands until the French annexation. Artois experienced rapid industrial development during the second half of the 19th century, fueled by its rich coal resources. During World War I, the front line between the opposing Central Powers and Allied armies in France ran through the province, resulting in enormous physical damage. Since the second half of the 20th century, Artois has suffered along with nearby areas because of the decline of the coal industry. Pierre-Charles Le Sueur (c. 1657 – c. 1705), born in Artois, noted explorer and trader. ^ "Artois" in The New Encyclopædia Britannica. Chicago: Encyclopædia Britannica Inc., 15th ed., 1992, Vol. 1, p. 607.